Ena Paribahan Contact Number along with its most of the ticket counter and booking offices addresses are here! 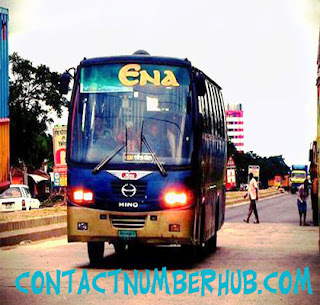 Ena Paribahan or Ena Bus services timetable and other necessary information with ticket prices are updated. It’s all routes bus schedules with location also updated in this content. The simplest way to buy its bus tickets through shohoz.com and some other online ticket suppliers. It offers tickets for the services of AC and Non AC chair coach buses run all over the country, especially to the long distanced districts. Here you will find detail contact numbers of the Ena Paribahan Bus Counters along with their locations. House No. 23, Road No. 8, Block No. A, Mirpur-12, Dhaka. Passengers of the Ena Paribahan must reach at the bus counter 20 minutes prior to departing time. Each passenger can take a luggage of 10 kg max. Additional charges will be applied for extra weight. Passengers must avoid carrying illegal goods and the bus authority is not responsible for any similar issues. The buses are smoking free. So, the passengers must not smoke inside the buses.You Can Try Hanif Paribahan to Stay Away. It also has bus services from Dhaka to Sylhet, Mymensingh, Netrokona, Jamalpur, Sherpur and Tangail. For more information, please contact with above mentioned contact numbers or visit your nearest Ena Paribahan Bus Counter.